There are many ways to determine that Brent Johnson had a spectacular night in net. You can watch highlights to see him sprawling across the crease denying shot after shot, you can look at the scoreboard and appreciate the first Pens' shutout of the season, or you can simply just listen to the Carolina fans. You know they are a bit frustrated when a "Let's Go Panthers" chant breaks out. Johnson's phenomenal goaltending turned out to be just the spark the Pens needed to bounce back from yesterday's disaster. The whole team looked better. 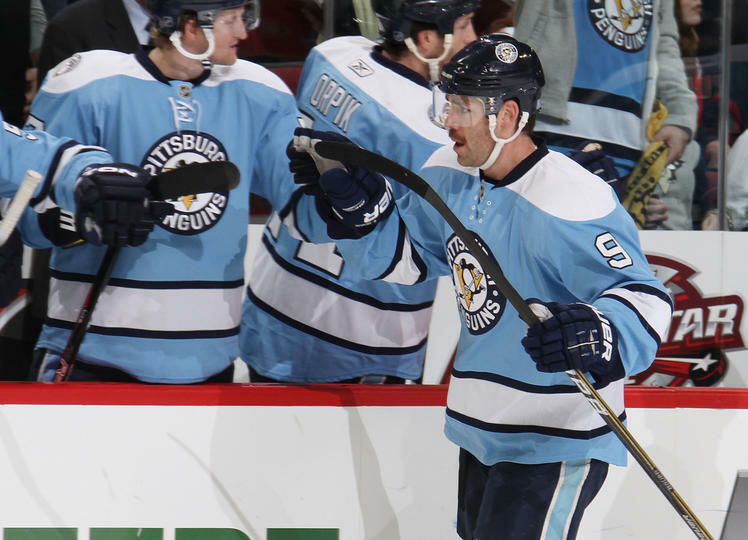 Pascal Dupuis and his mustache lead the way for the Pens offense. Dupuis scored 2 incredibly timely goals, the first early in the 1st period to give the Pens the lead and his 2nd midway through the 3rd to put the game out of reach for the Pens. But let's face it, the game was out of reach from the moment Brent Johnson stepped onto the ice. He saw everything, and he stopped everything. Maxime Talbot also scored a goal for Pittsburgh on a play where he wasn't really trying to shoot but the puck found its way past Cam Ward for the goal. 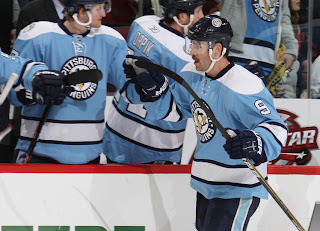 Nifty little forehand-backhand move by Dupuis = Pens 1st goal. Offense- B+ Everyone looked more energized and certainly more involved in the game. They put some pressure on the Canes' D, and they were rewarded with a few goals. There really weren't that many "pretty" plays but they were very efficient and effective. Defense- A- A shutout may only get recorded for the goalie, but it is a testament to the whole defense. Played very well. Johnson- A+ He was perfect, therefore he gets a perfect score. Powerplay C+ They did only get 2 opportunities, but there is still something missing from this unit. Eventually they'll click, but they just can't seem to get out of this rut yet. Penalty Kill A- They dominated Carolina for many of the PKs. And when they didn't, Johnson was there. -Of course with every triumph there is a negative. Kris Letang reagitated his hand and left the game midway through the 2nd and didn't return. Also Malkin was a scratch. -Orpik and Engelland looked fantastic. -Asham did get a point, but I still get the sense that they are trying to figure out what to do with him. He did show signs of being an effective weapon once properly acquainted with the team, but there is still some refinement left to do. Is there a better surprise than Derek Engelland? He plays a very solid defense and will drop the mitts with anyone. At this point I wouldn't be afraid to move Godard at all. Get what you can for him and clear up some cap space.